When people in the Chippewa Valley need an escape from the summer heat, the water of our lakes and rivers is hard to beat. This was just as true 100 years ago as it is today. Back in 1916, Half Moon Lake in Eau Claire was a popular place to get cool – and to look cool. This photo taken that year shows just how much swimming suits have changed over the past century. 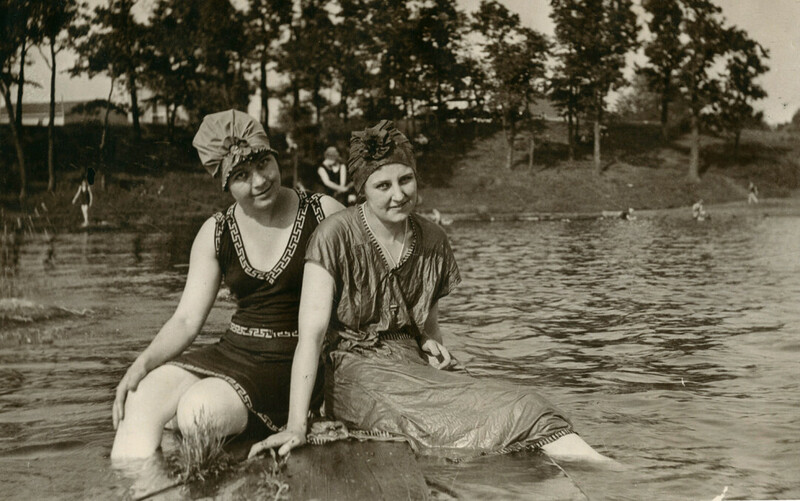 The two young women in this picture – Evelyn Welsh and Mahala Ray – wore typical swimming outfits of their era, complete with caps and skirts. It you think it would be hard to be comfortable wearing all that wet fabric, at least they weren’t living a few years earlier during the Victorian Era, when women often wore knee-length wool dresses with puffy sleeves to take a dip. When you’re at the beach this summer, think about how fashions have changed over the years. How is the clothing you see people wear different than it was in the past? How is it the same?